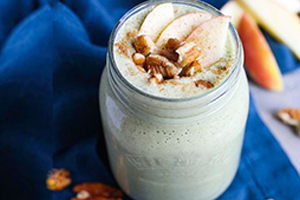 I am huge fan of green smoothies (see here and here), because they make a super easy, quick and nutritious breakfast or snack. 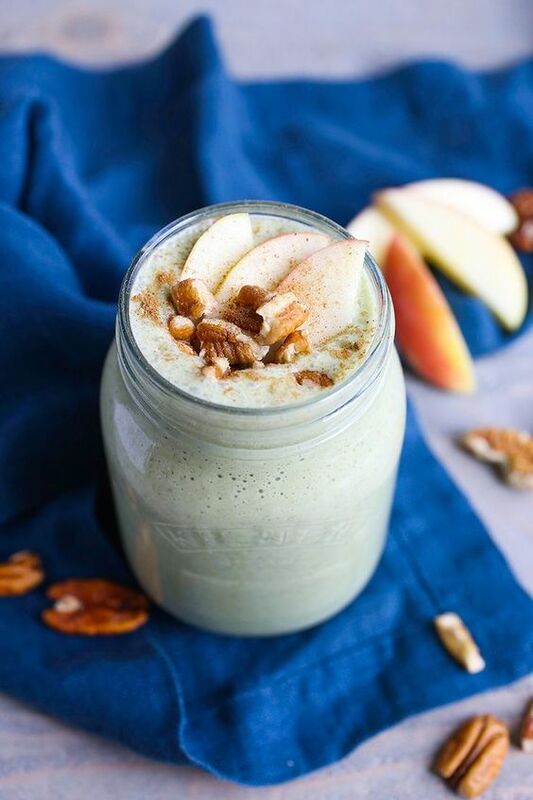 To ring in the new year, I decided to step up my green smoothie game a little and create this irresistible Dairy Free Apple Pie Smoothie for you guys. 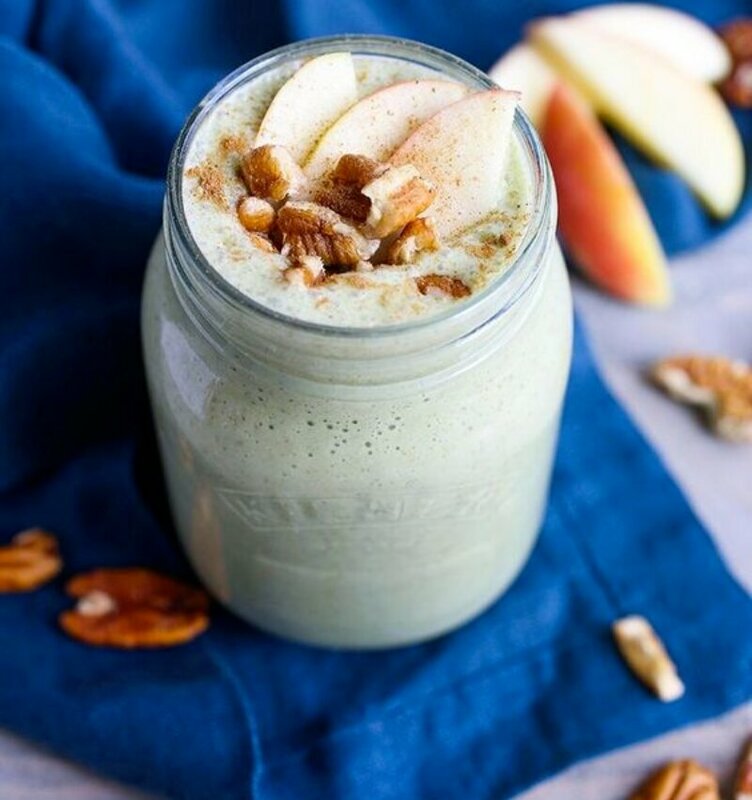 It contains all the same nutritious goodness as my regular go-to smoothies but includes some extra special ingredients like apples, pecans and Primal Palate’s Apple Pie Spice. 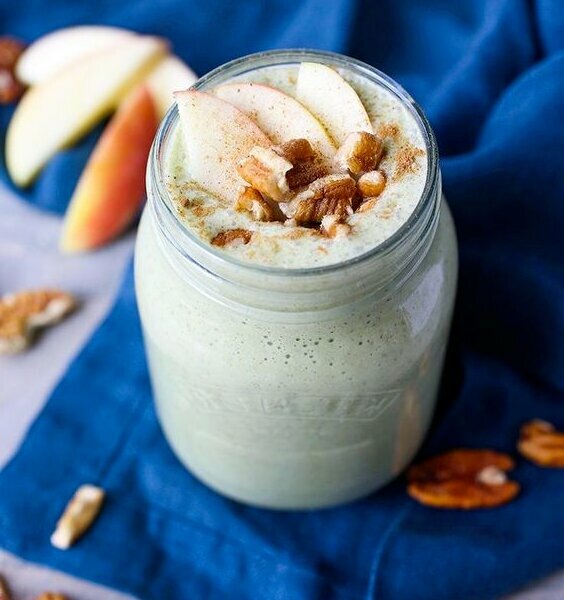 You’ll probably notice that these photos have some pecan pieces, apples and extra spice on top. While yes, I partially did this because it looks nice, I also always make a point to add something “chewable” to my smoothies. Often this is something like local bee pollen or in this case, chopped pecans. Why on earth would I want to chew my smoothies? Well, I’m glad you asked! One of the main reasons I like to drink smoothies is because of their dense nutritional profile. However, when we “drink” or food, something interesting happens. Not only does chewing food break it down enough so that we can swallow whatever we’re eating, but chewing also tells our saliva to produce an enzyme called Ptyalin. Ptyalin, similar to all digestive enzymes, ensures that our body will be able to break down and absorb whatever nutrients are in the food we’re consuming. By opting out of chewing, we are telling our body not to produce the digestive enzymes it needs to properly absorb the nutrients in our food. Sooooo, next time you go to make a smoothie, make sure to add something chewable to ensure your body will absorb all those important nutrients! Combine all ingredients from softest to hardest in a high powered blender and blend until fully combined. Top with chopped pecans and/or additional toppings.